OpenLaw API Tutorial — Build a complete DApp with the OpenLaw API + Truffle + React.js. Get Started With OpenLaw in Minutes — Build a complete Dapp with the OpenLaw API + Truffle + React.js. At OpenLaw we want to help your decentralized application (“DApp”) integrate with today’s legal frameworks. A DApp is a software application where the backend code is run on a decentralized and distributed blockchain such as Ethereum, as opposed to a centralized server. While this tutorial covers deploying a smart contract in Truffle using React as the front-end, it is not necessary to use Truffle or React with OpenLaw. These tools are just one way to get from end-to-end to build your DApp and have it powered by OpenLaw. So, if you already have a smart contract deployed and want to skip the section about deploying a contract with Truffle, please feel free to do so. Already Installed on your computer (to do this tutorial in its entirety, make sure you have all of the below). Node version 8.9.4, NPM version 6.0.0, Truffle version 5.0.3 . For this tutorial, we are using a globally installed version of Truffle. If you haven’t installed Truffle, See the Truffle docs and Truffle NPM package. Also needed are MetaMask in your browser. Rinkeby Ether in your MetaMask account and an Infura.io account to connect your DApp to the Rinkeby testnet. If you want to skip straight to the code go to the Github here. 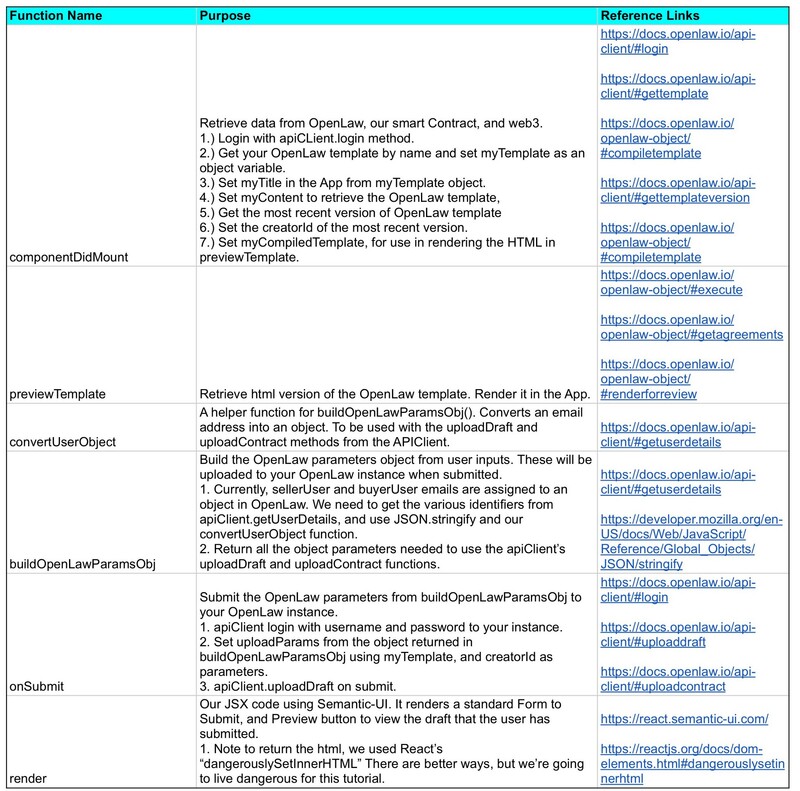 If you want to skip the deploying a contract with Truffle section, and go straight to building with the OpenLaw API in your App.js click here. Sign-up for OpenLaw account. If you do not already have an OpenLaw account, you can sign up for a free account. OpenLaw Documentation. We will primarily be referencing the documentation from the OpenLaw APIClient and the OpenLaw Object both of which are packaged with OpenLaw’s NPM module. Create an OpenLaw Template. 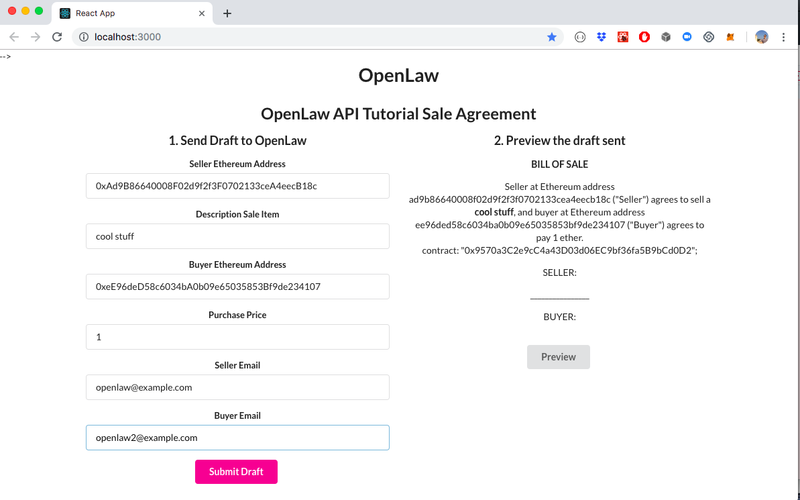 Log in to the Openlaw.io instance you are using and create a template, for this demo I will use the title “OpenLaw API Tutorial Sale Agreement”, but you can call your agreement whatever you like. Then cut and paste the code below (For a full explanation of how to build this template, please see OpenLaw’s previous tutorial). The previous tutorial explains how to create a “Bill of Sale” Template, which is a simple blockchain based legal agreement where one party agrees to buy an item at a certain price from another party. 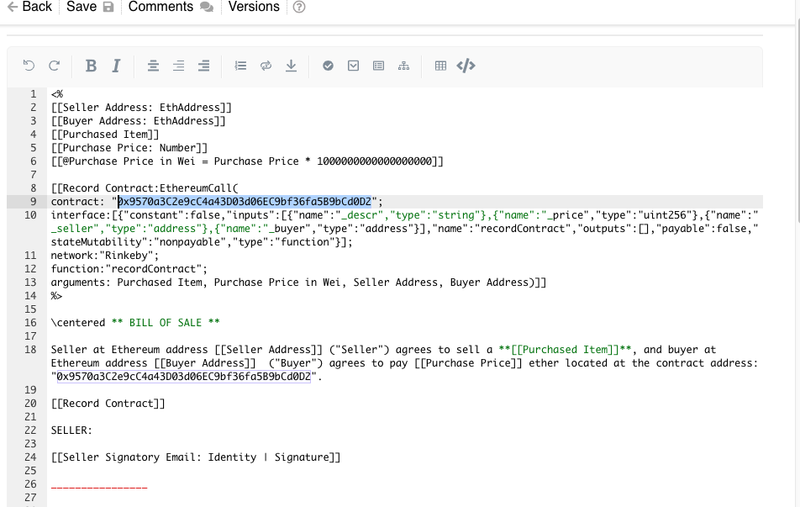 Seller at Ethereum address [[Seller Address]] ("Seller") agrees to sell a **[[Purchased Item]]**, and buyer at Ethereum address [[Buyer Address]]  ("Buyer") agrees to pay [[Purchase Price]] ether located at the contract address "Insert your contract address". Set up with Truffle’s React Box, Add CSS, and Deploy a Smart Contract. See: the Truffle React Box docs. As noted before, it is not necessary to use Truffle and/or React.js to with the OpenLaw API. Root directory with .env and truffle.js added. Add the CSS. From the root directory add Semantic-UI and Semantic-UI-React for CSS. You can also use your preferred CSS framework. Note: if prompted in the terminal, install semantic-ui in default folders. 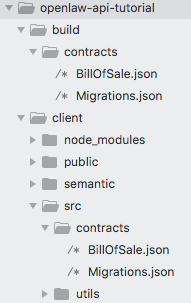 Deploying the BillOfSale.sol contract with Truffle. You will need a free Infura.io account for this part of the tutorial. Infura.ioprovides free access to an Ethereum node, which means you do not have to download the entire Ethereum blockchain to start developing. Sign up for free, login, go to the “Dashboard”, create a new project, after you create a new project, use the “Project Id” for your Infura API key. In the .env file create a MNEMONIC and INFURA_API_KEY variable. It should be your own mnemoic and Infura API Key (Note: do not put quotes around the mnemonic). this command will clear the ./build folder, and is good to use whenever the solidity files are changed. Save your contract address (I highlighted mine in blue for example). Open a second terminal window and from the root directory go to your client folder and run the DApp on http://localhost:3000/ in your browser. (Note:until we change our App.js file error will render in the browser, which we will get to in a moment). Then go to client/src/App.js . 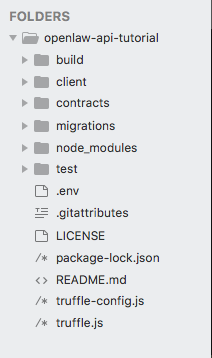 This is where we will be importing our OpenLaw API Client and OpenLaw Object from the NPM module. We will be doing the bulk of our coding in App.js. 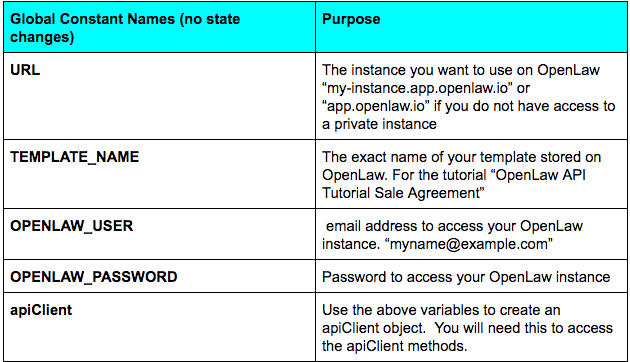 Configure the OpenLaw API constants and access our OpenLaw instance and current template of OpenLaw Tutorial Sale Agreement. Capture the User’s input from the Form. Send the OpenLaw object to the OpenLaw instance and have it appear in the “Draft Management” or “Contract Management” tab. Below is a description of all the variables and functions we will be using to integrate OpenLaw into our App.js file. The App.js code in its entirety is after these tables. Navigate to your OpenLaw Instance, login, and go to the “Draft Management” link in the menu. Now you should see the draft you submitted to OpenLaw.